That's like saying "Derrick Rose has been scoring more points when he shoots the ball in the basket." Isn't the "opens both of his eyes" part a given? I'm fairly certain that's the standard method most people choose to employ for sight. Do you know anybody who walks around looking at things with one eye? Is it even possible to have double vision in a single eye? 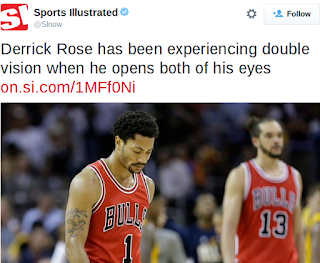 "Chicago Bulls point guard Derrick Rose said that he has been experiencing double vision when he opens both of his eyes, reports K.C. Johnson of the Chicago Tribune. Rose added that he feels he could play with only one eye open."